Michael Lumb, with 422 runs already gathered in this season’s competition, after scoring three centuries from three visits to the crease, fell for only 15 at the start of the day. When Thakor followed up that dismissal with the wicket of Greg Smith, one over later, Notts had slipped to 48 for two but that was the last Falcons success for 13 overs as Wessels and Brendan Taylor rattled up a third wicket stand of 122. Wessels took 19 off an over from Thakor and then reached his fourth one-day century from 80 balls, having hit 16 fours and three sixes. He perished when miscuing an attempted reverse sweep off Matt Critchley and Taylor followed in the next over, for 44. Samit Patel’s 31 and 28 from Dan Christian set the hosts up for a big finish and it was applied by Chris Read and Steven Mullaney. Read hit three sixes in his 39-ball innings of 59 and Mullaney hit three in a row off Ben Cotton on his way to 39 not out. There was even time at the end for England’s newest cap Jake Ball, playing on his home club ground, to smash the biggest blow of the day as he thumped Thakor back over his head and out of the ground. The Outlaws’ tally of 340 is the most they have ever scored in a one-day match against their local rivals. In pursuit of potentially their most successful run chase, the Falcons lost Wes Durston, their captain, for only six. Slater rattled along, scoring 40 of the first 51 runs but edged behind, one ball after reaching a 48-ball half century. 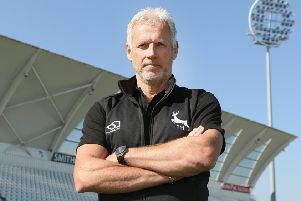 Dan Christian, who took five for 40 when Notts used the picturesque club ground for the first time, last season, removed Wayne Madsen and when Hamish Rutherford edged Luke Fletcher behind the visitors had slid to 103 for four. Thakor and Neil Broom rallied with a stand of 47 but Mullaney nipped them both out in quick succession; Thakor bowled for 29 and Broom was scooped up by a diving catch from Ball for 25. Critchley, batting at number eight in the order, showed some much-needed fight and he was joined by Harvey Hosein in a ninth wicket stand of 63. Gurney, who took three for 47, closed out the innings by catching Tony Palladino off his own bowling. Notts move on to seven points and face Yorkshire next, at Scarborough on Wednesday. Derbyshire remain on six points, ahead of a home clash with Lancashire on the same day.